Design is Evolving. But What’s Next? The word nice once meant silly or simple. Silly, meanwhile, originally referred to things worthy or blessed. The verb groak once described the act of silently watching someone while they eat, and in the 1500s brabble meant to converse loudly about something inconsequential. Maybe you’ve noticed, but we no longer use groak or brabble. The point is, words and concepts evolve or even disappear altogether, and the process is happening at a faster rate than ever. Design appears to be undergoing a transformation of its own, becoming something else — maybe even something more. But why is it changing, what is it becoming, and what could be the ramifications? Or, is all of this just a bunch of brabble? Just a few decades ago, a design degree was rare. Few universities had programs, and there was little diversity among the scant offerings. To the average Jane, design was a vaguely understood concept that explained the tailoring of her clothes or the look of the car she drove — besides a few niche, mostly artistic circles, it was not yet widely recognized as a tangible discipline. Fast forward to today and oh how things have changed. Designers and new design disciplines are everywhere. 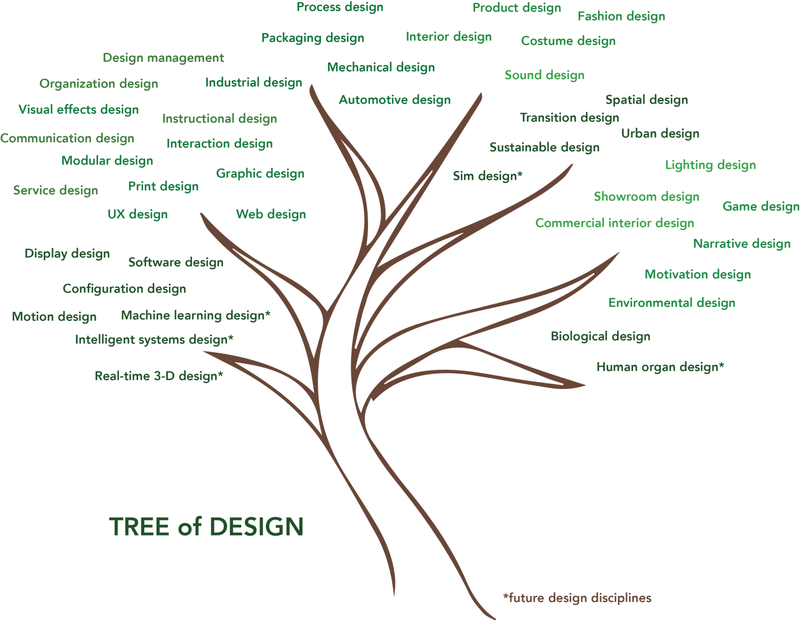 There is industrial design, visual effects design, environmental design, organizational design, augmented reality design — the list is robust and cuts across industries. Of course, the skills these professionals possess and the sorts of things they do widely differ, but all still — in name, at least — fall under this same umbrella we call design. Design has diverged, and brand new sub-disciplines have been codified at a rate that, not coincidentally, mirrors the astounding pace of technological advancements. Yes, before long, there will be human organ designers. You can count on it. As the pace of technological innovation and competition has accelerated over the last few decades, products and services that embrace new technologies and offer a great user experience have become one of, if not the, most important competitive advantages an organization can have. Think Apple’s success and Microsoft’s past struggles, or even the rise of Netflix and demise of Blockbuster. Importantly, it’s no longer just relevant to consumer-facing entities. Companies like SAP have been winning design awards and simultaneously generating real value as they re-imagine the way the enterprise and industry interacts with technology. Recently, however, design is being seen as more than just a differentiator when it comes to successful products. The root causes of great design — the mindset, skillset and methodologies that, when effectively combined, create successful experiences and solve pesky problems — have been formalized and are now in the spotlight. This idea, termed “design thinking”, is more and more seen as something essential, even revolutionary. Go ahead, google “design” or “design thinking” and explore the results. There can be little doubt: they have reached buzzword status, becoming part of the public consciousness like never before. But something interesting is happening. While “design” is still widely popular, its usage (according to google searches) has actually been going down over the last 12 years. Meanwhile, the use of the phrase “design thinking” has relatively surged since 2010. There can be little doubt: design is giving way to design thinking, and it is the latter now on the world’s lips and finger tips. In particular, design thinking has become part of the corporate vernacular and is hastily being absorbed into — perhaps altogether rewriting — the larger playbook of sound business practices. John Maeda’s exciting #DesignInTech report strengthens this point. Defining something that is so quickly expanding in scope and influence, all while simultaneously breaking apart into a whole new suite of sub-disciplines, is not easy. Here are just a few questions that arise: is design the parent term, and design thinking its offspring? Or, has design thinking always existed as a foundation to design, and we are only now starting to formalize the difference? What are the commonalities that tie everything under the design umbrella together? Are all designers also design thinkers, and do you need to be adesigner to be a design thinker? Many people still think of design as the properties and aesthetics of a house, cloths, or, more recently, hardware technology or even a digital user interface. Most of us still don’t think of it as a verb — a process, a particular way of approaching a “problem” — and certainly not as something around which an entire organization can be organized or that could change the world. Design, according to Merriam-Webster: to plan and make decisions about (something that is being built or created): to create the plans, drawings, etc., that show how (something) will be made; to think of (something, such as a plan): to plan (something) in your mind. Design thinking, according to Creativity at Work: a methodology used by designers to solve complex problems, and find desirable solutions for clients. A design mindset is not problem-focused, its solution focused and action oriented towards creating a preferred future. Clearly, the scopes of each definition are very different. Design is limited, even mundane, while design thinking is set up, almost dramatically so, as a way to “solve complex problems” and create “a preferred future”. As design in the traditional sense — the user interface of a website, for instance — becomes more and more robotized and design thinking as a methodology gains ever more popularity and respect, the responsibilities of designers will continue to evolve. Already, as problem finding and problem solving “design thinkers”, their roles have moved upstream. For today’s designers, it’s no longer just about pushing pixels around a screen, but about the big issues. Where Does Design Go From Here? There is no shortage of promise and potential, but questions abound as to what’s next. As more sub-disciplines emerge and more people not formally trained in design adopt design thinking, what will become of the term and the movement? Are all design disciplines equally apt at design thinking? Are design programs preparing students to bare the weight of what is now expected of them? Will the next crop of design thinkers necessarily come from traditional design programs? As ‘design thinking’ becomes more integrated into our everyday lives, will the concept become an assumed commodity? Obsolete as a term yet omnipresent in practice? Or, will we maintain the nomenclature and pay homage to the discipline from which the powerful methodology originates, elevating design to new heights? Regardless, with design and design thinking at center stage, the future feels bright. While it is tempting and natural to question all of the vaulted rhetoric surrounding design thinking (after all, can something so seemingly simple and obvious really be so revolutionary? ), it’s hard to argue with the core principles. If science and the foundations of logic upon which it rests seeks to establish absolutes, design can be thought of as a valuable foundation from which to approach the increasingly complex, ever-shifting problems present in modern human industry. After all, while much of modern life now leans on complex combinations of 1s and 0s, the modern world itself is full of difficult questions that 1s, 0s and logic alone can’t solve. When done right, design thinking just might be our best bet to getting it as close to “right” as possible, regardless of what its called or who adopts it.